Hamstring injury treatment will vary depending on the severity of the injury to the hamstring muscle groups. TIME is your best friend when it comes to injured hamstring treatment and recovery. Hamstring rehabilitation needs time to heal the hamstring muscles, and the worst thing a player can do is come back to playing without fully rehabilitating the hamstring muscles. Trying to go back to running before the hamstring has fully recovered will cause more harm and in most cases prolonged hamstring injury that will occur more often in the future. Minor to moderate hamstring strains will heal with rest and time away from activities that require running. Hamstring injury rehabilitation can be shortened in time by doing few simple things that will shave off several days or weeks from regular hamstring rehab time. Grade I hamstring injury is considered a mild stretching of the hamstring muscles, where there is no real tear to the muscle but it is simply overused and overstretched. Grade II injury of the hamstring muscle is a moderate injury where one or more hamstring muscles has suffered a small tear in the muscle causing discomfort and pain for the athlete. Hamstring injury treatment for Grade I and Grade II Injury is very similar. The only difference will be TIME to properly heal, during which athlete should stay away from any physical activities that involve running. Grade I hamstring treatment usually lasts 1-2 weeks for hamstring muscles to heal, and Grade II hamstring injury rehabilitation will need 2-6 weeks to heal, depending on the severity of the injury. Hamstring injury treatment listed below is used to speed up the recovery for Grade I and Grade II hamstring injury. DO NOT go back to running and playing soccer for 1 full week when Grade I injury occurs, and 2-3 weeks with Grade II hamstring injury. Time is the most important factor in hamstring rehabilitation. 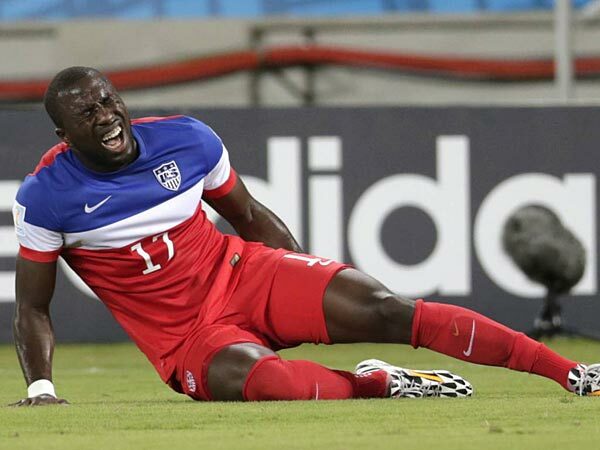 Treatment will only speed up the hamstring injury recovery time. Rest - Take a break from every activity that involves running. Ice - Use cold packs on the injured hamstring for 20 minutes at the time, several times a day with at least 3 hours in between applying ice. Compress - Wear an elastic compression bandage to prevent additional swelling and blood loss to the injured muscle. Elevate - Prop the leg up on a pillow, or something similar, where the leg will be higher than the heart. This will allow more blood flow to the injured muscle reducing swelling and speeding up recovery time. RICE is every athletes best friend when it comes to speeding up recovery time after an injury. Use anti-inflammatory medicine such is Ibuprofen to help reduce pain and inflammation. Start stretching exercises as soon as the pain and swelling subsides. Start a strengthening program to rebuild the strength of the injured muscle to prevent re-injury. Make sure to increase the strength training gradually. Use a thigh wrap to provide support as the muscle heals. Its good to use a compression bandage before going to sleep for faster healing of the muscle. Most importantly, take the proper TIME to heal the hamstring. It is most important to take the time off from any activity that involves running. Grade I hamstring injury rehab should take no less than 1 FULL WEEK, or in some cases a little longer to recover and get back to training and running activities. Grade II hamstring rehabilitation should take no less than 2 FULL WEEKS, or in some cases a little longer to fully recover and get back to training and running activities. Our body is the best indicator of when we should get back to playing and training. If the hamstring muscle feels tight, with even slightest pain noticeable, player should wait for any discomfort or pain to subside. Suffering Grade III hamstring injury will be felt by the player with sharp pain and inability to walk, let alone run. Any Grade III hamstring injury should be evaluated by a Doctor. If you feel like you have suffered a Grade III hamstring injury, DON'T WAIT but go and see a Doctor right away. Grade III hamstring injury will involve complete tear in one or more hamstring muscles, and should be treated differently due to the severity of the hamstring injury. Grade III hamstring injury treatment may require surgery for proper recovery. Trying to come back to activity before the time is right will lead to a more frequent injury of the hamstring, and more frequent time watching from the sidelines. Take the time and wait until the hamstring muscles have fully recovered before attempting to go back to your sport. Going back to active training and playing too soon will cause more harm in the long run, sidelining player more frequently and regretting not taking the time to fully recover. I hope you have a better understanding of hamstring injury treatment. For more information on hamstring injury and treatment visit Hamstring Injury, Treatment and Exercises.